Sophia Duckor-jones is a roving reporter. Currently in Greece for three months volunteering and writing about the refugee camps. paydesk has 1 journalist in Chalkida. Our journalists can do broadcast reports, as well as printed media and photography. 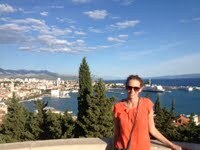 Our top journalist in Chalkida is Sophia Duckor-jones.